On the day that a minute's silence was observed before the throw-in in memory of Frankie Byrne, the last surviving member of Meath's first All-Ireland SFC-winning team of 1949, who died on Friday - Meath put in a performance that resonated with its illustrious past. The manner in which Andy McEntee's men repelled Armagh's wind-assisted rally was commendable. Nine points in arrears at the break, Kieran McGeeney's charges cut the deficit to its narrowest as the hour mark beckoned. With Donal Keogan to the fore, Meath's response was outscore the visitors by 1-3 to 0-1 in the time remaining. Mickey Newman took the scoring plaudits but equally impressive was that seven other pitched in. One such was sub Ethan Devine who scrambled the ball to the net in the first of four minutes of added time at the end of the game. That left Meath seven to the good before Rian O'Neill's late free concluded matters that resulted in Armagh's first loss of the campaign. Cillian O'Sullivan started in place of the listed Ethan Devine and had a positive impact on proceedings, notably when pursuing a lost cause that led to the final score of the opening-half. Backed by the strong win Meath landed four points from as many different players in the opening five minutes. The next 15 minutes yielded just one score, Stephen Sheridan's opener for the visitors. Just when Meath's bid to build-up a lead appeared to be flagging, a foul on Thomas O'Reilly led to penalty that was well-struck by Newman. The Royals went on to lead by nine at the break, 1-9 to 0-3. In the 10 minutes from resumption, Armagh outscored Meath by 0-5 to 0-1. With Rory Grugan and Rian O'Neill prominent in attack they continued to make headway. Their inability to find the net stymied their strong rally. When the chance came Meath secured both points. 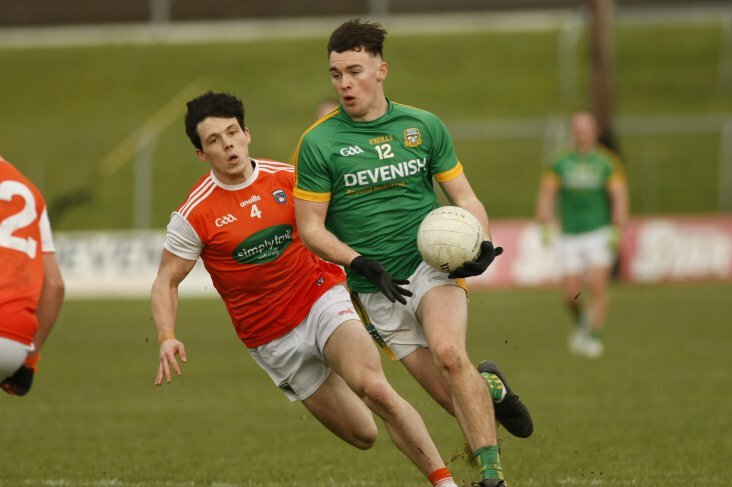 Meath - A Colgan; S Lavin, C McGill, R Ryan; J McEntee (0-1), D Keogan, N Kane; B Menton, S McEntee (0-1); C O'Sullivan (0-1), D Campion (0-2), B Brennan (0-1f); B McMahon, M Newman (1-5, 1-0pen, 0-5f), T O'Reilly (0-2). Subs: E Lynch for N Kane, G Reilly for B Brennan, E Devine (1-0) for B McMahon, M Burke for C O'Sullivan, G McCoy for R Ryan. Armagh - B Hughes; C Mackin, A McKay, R Kennedy; A Forker, J Morgan, G McCabe; S Sheridan (0-1), N Grimley; J Hall, R McShane (0-1), M Shields; R O'Neill (0-5f), S Campbell (0-2), R Grugan (0-4, 2f). Subs: J McElroy for S Campbell, J Og Burns for J Hall, P Hughes for R Kennedy, A Nugent for C McShane.